I must say picking these two pens up and using them this week at work as furthered my curiosity in this endeavor. 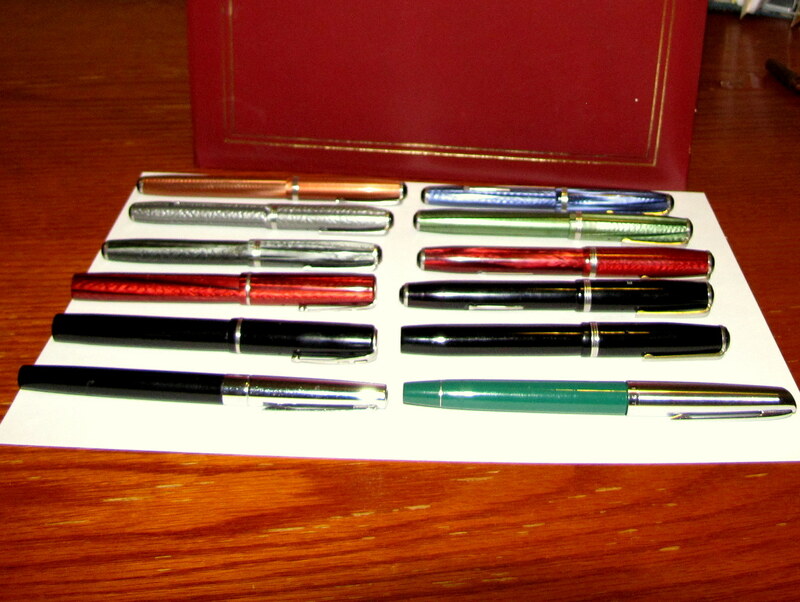 Any insights, or random thoughts on fountain pens, from aficionados of the subject matter would be welcome. I am going to see if I can not lose these two pens for 6-8 weeks and if I can manage that, I am planning on purchasing a nice fountain pen. 50.00 or less is what I am willing to "invest" in said purchase. Is that enough for a nice fountain pen? Recommendations? Freddy is big into the fountain pens. I think PhilNH5 is as well. Check out The Goulet Pen Company (www.gouletpens.com). The Goulets have done a fantastic job of putting together informational videos while also offering a great variety of fountain pens & accessories. Brian is right. The Goulet Pen Co. Is a great place to start. Also, look at The Fountain Board, The Fountain Pen Network, Fountain Pen Geeks, and Jet Pens, anong others. Take a look at what has already been posted here, as well, and don't be shy about asking questions here. We'll do our best to help. For pens $50.00 or less, consider TWSBI, Nemosine Singularity, or even a vintage pen in good condition, like a 1940s Esterbrook J-series. I have a post here about one of mine. Just remember that if you enjoy fountain pens they can be as addictive as wet shaving goodies. (07-10-2015, 10:30 PM)Freddy Wrote: Brian is right. The Goulet Pen Co. Is a great place to start. Also, look at The Fountain Board, The Fountain Pen Network, Fountain Pen Geeks, and Jet Pens, anong others. Take a look at what has already been posted here, as well, and don't be shy about asking questions here. We'll do our best to help. For pens $50.00 or less, consider TWSBI, Nemosine Singularity, or even a vintage pen in good condition, like a 1940s Esterbrook J-series. I have a post here about one of mine. Thanks all, much appreciated! Freddy any recommendations on what type/brand black ink I should order and also what "type" of pen I should get? Cartridge converter, vacuum filling, piston filling etc. the cheap cheap one I bought at the store is a simply cartridge one and the one I got at the Antigua store is a cartridge converter. Not knowing what I was doing I got a container of ink at a craft store for five bucks.... Writes fine, still learning, but when I order a new pen I'd like to get some great ink too. Definitely hit up Goulet Pens. They sell about 600 inks, have swabs showing what each color will look like, and have some discriptors as well. Not all inks are the same, and that includes blacks. Some inks will write wetter while others, drier. Some, like Noodlers American Eel Black, are lubricated and waterproof. Brian Goulet does videos that you may find quite helpful. As for pens, lever fillers (found mostly on vintage pens), piston fillers, vacuum fillers, and others all serve the same purpose so it's really a personal preference. As you are just starting out, l would recommend a cartridge/converter system. Maintenance is easy, you have the choice of cartridge or bottle ink, and the price range of those types of pens tends to be broader offering more choices. I don't plan on collecting fountain pens just using one daily now at work etc.... But I must say I really like this pen and ink....I've written three letters tonight. The people that will receive them are going to think I'm nuts. I love Pilot Iroshizuku inks and the pen has classic good looks. I hope they give you a lot of writing pleasure. The recipients of those letters won't think you're nuts; they'll be jealous. The Goulets have built their reputation on their service so I am not surprised at your thoughts about the company. I'm also in fountain pens and inks. I mainly using vintage fountain pens such as Esterbrook, Waterman and Sheaffer. I also enjoy modern pens by Waterman, TWSBI, and Lamy.